You can never have enough one-pot meals in your cooking arsenal. After a simple marinade, everything gets dumped into a pan. Then baked and served straight from it. It’s delicious as it is, thanks to the trifecta of orange and paprika and saffron (don’t leave this out!) but a little aioli drizzled over is a good compliment to the flavors. FYI, there’s a good amount of sauce that’s yielded here, making this a bit stew-like. You can use a slotted spoon to portion it out, saving the juices to add into bone broth or soup later on. Or you could optionally serve it with the juices over cauli-rice or your favorite mash for more of a comfort food feel. Whisk together the orange juice and zest, extra-virgin olive oil, saffron, smoked paprika, sea salt, pepper, minced garlic, and thyme leaves in a large bowl. 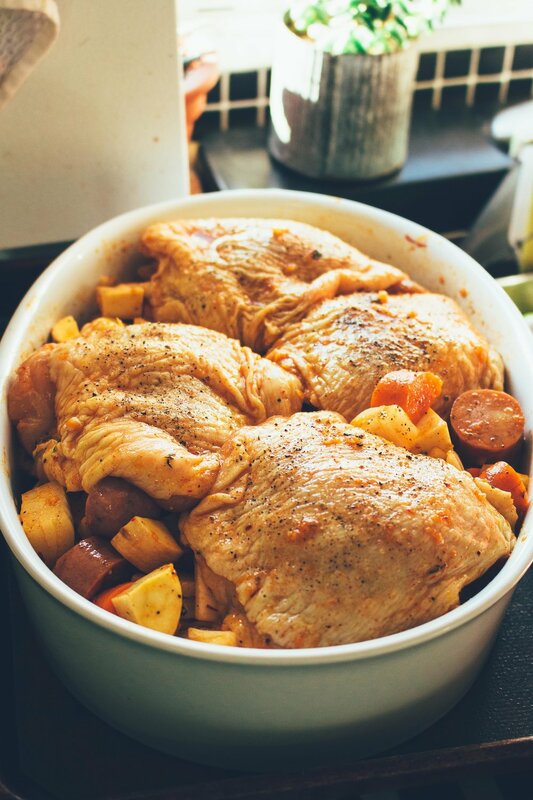 Pour into a large ziplock bag and add the chicken thighs. Seal the bag with much of the excess air removed (so the marinade comes in contact closely with the surface of the chicken) and place the bag in a large pan. This is to catch juices in case of a leak. Place the pan in the refrigerator to marinate for 4-8 hours. Pour the marinade out of the bag into a large baking pan. Add the sliced sausage, chopped parsnips, carrots and onion. Toss well to coat. Top with the chicken, tucking it in amongst the other ingredients. Cover the pan loosely with tinfoil and bake for 30 minutes. Remove the tinfoil and cook for another 10-20 minutes, or until the skin of the chicken is dark, golden, and crisp. sorry if this is a silly Q, but by pre-cooked sausage, did you cook it separately, then slice it and add to dish to further cook? Hey Sara, not silly. Some brands of sausage are sold pre-cooked and others are not. Examples of pre-cooked are Aidells, True Story, Trader Joe’s, and Niman Ranch. I haven’t tried buying an uncooked sausage, cooking it separately, and then adding it in…It may work though. Made this tonight with pork tenderloin instead of chicken, chorizo and parsnip/potato mix. Turned out perfectly! It was 2 yr old, 7 yr old, and (picky) Dad approved. Looking forward to trying more of your recipes!